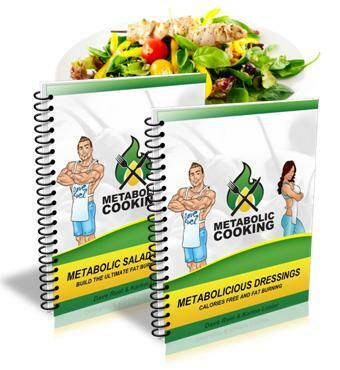 Metabolic Cooking has gained immense popularity after appearing on TV, Radio and in many magazines such as Men’s Health and Fit & Firm Females. The program has taken the weight loss industry by a storm. Karine Losier – Also known by the nickname “Lean Kitchen Queen” is not just a bubbly little chef, she holds a master’s degree in Psychology, and as such she understands the internal struggle and psychological aspects surrounding food. Dave Ruel – Dave also was known as “The Muscle Cook” is one of the most respected and trusted fitness cooks in North America. He is also a competitive bodybuilder, a professional Fitness Coach, and Nutritionist. He believes that the process of weight loss and muscle building starts in the kitchen. And it should not be boring, instead, he advocates the creation of meals that are full of flavor, whilst helping you to burn the fat inside your body. Super simple instructions. All of the instructions are easy to follow and simple to prepare pretty much using the ingredients you have in the kitchen. All the recipes contain between 5 and 10 steps, so you don’t have to worry about trying to figure out a complex recipe with hundreds of ingredients. Overwhelming. For a beginner, it can be quite an overload of information. It took me a couple of days to sift through all the wealth of information. Diet Based Only. Also, most experts would agree that the most effective way to lose weight is to combine a healthy diet with exercise. This program does not recommend any workout systems. So that’s something you’ll need to sort out yourself.